Wallington church doesn't sound particularly interesting when you read about it in guidebooks; for example, Pevsner has it done and dusted, building, contents and all in just sixteen lines (only one more than he deems necessary for describing the Waltham Cross Shopping Pavilion of 1968-73 on the next page). Yet a visit proves it to be greatly appealing. 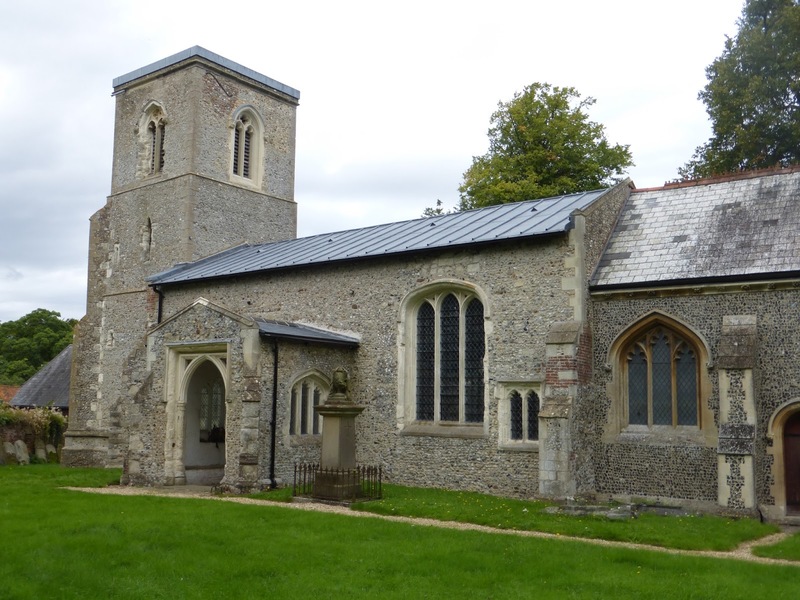 It's true that architecturally it's pretty run-of-the-mill and contains little worth going out of your way to see, but it has an atmosphere that many better endowed churches lack. 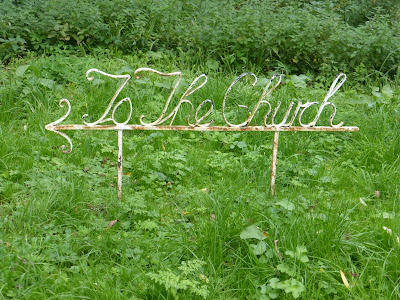 The church is all of the 15th century (except the chancel, which is of 1864). 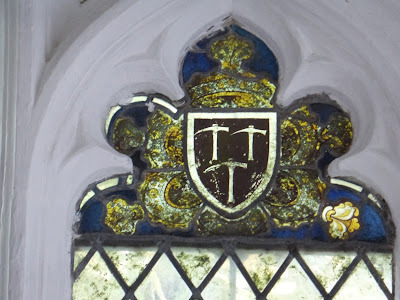 (What was the purpose of the diminutive nave window right of centre in the picture above? Did it light a nave altar?) 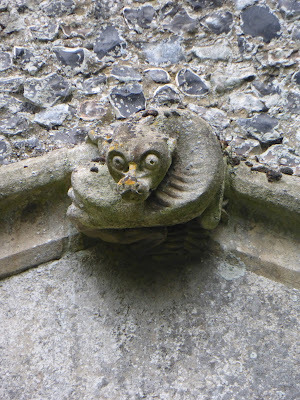 On the north side are a number of small original grotesque carvings. 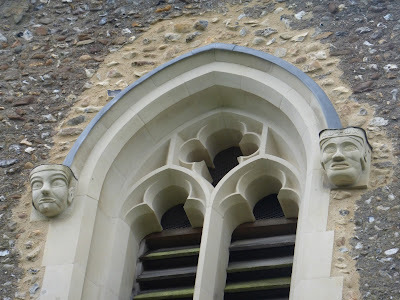 The second one pictured here is especially lively, as it twists round to stare uncompromisingly at the onlooker. 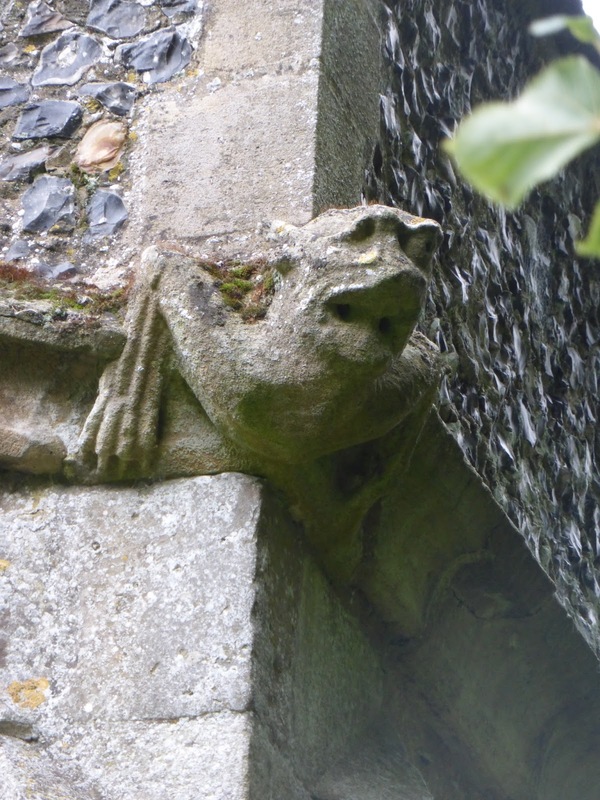 It's sometimes said that carvings like these (they're often called gargoyles, but a gargoyle is a carved waterspout) are found exclusively on the north, sunless sides of churches, their job being to ward off the evil that was believed to assault the church from that direction. It's true that there are no grotesque carvings on the south side at Wallington, but there are at very many other churches, so this theory is false; the theory reveals more about us and our desire to see medieval people as ignorant and superstitious than it does about them. The interior of the church is full of light and a vivid sense of the past. 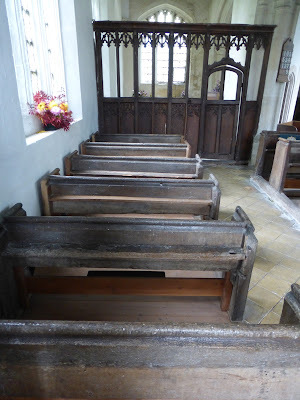 Most of the benches are as old as the building, and although they're very plain - as plain as the ordinary people, as ordinary as you and me, who've come and gone over the unfolding years - to sit in them is a charged experience. You're sitting where people have sat for more than five centuries. 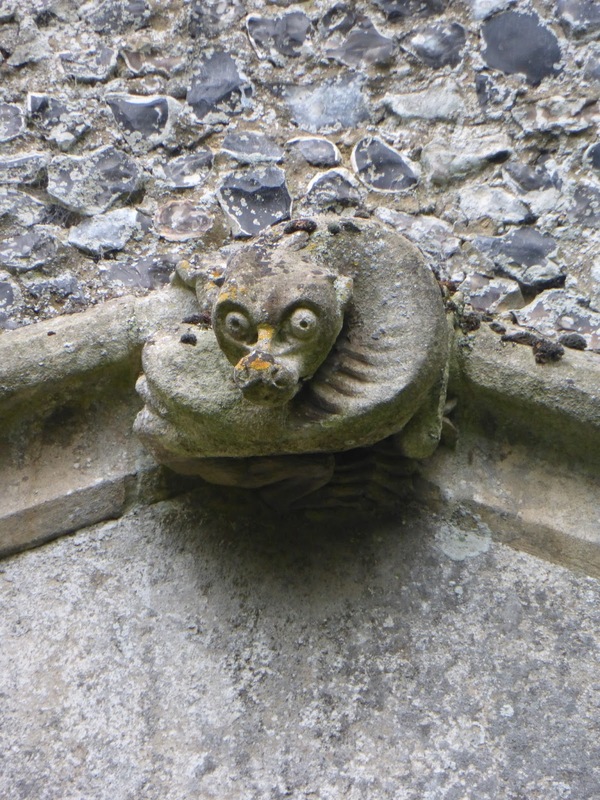 Here they've cooed over babies at baptisms, made merry at weddings, been inspired by or yawned at sermons, and mourned at funerals. They're all around you as you sit there now. 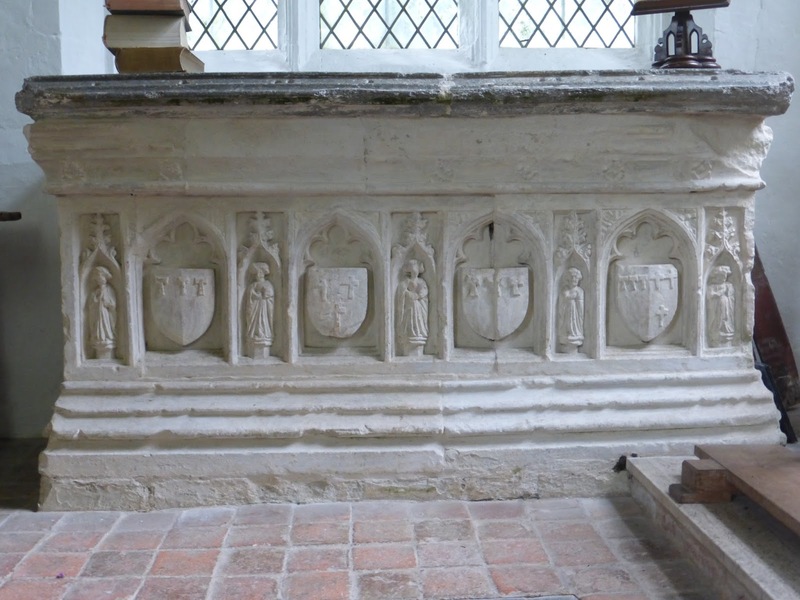 In the north chapel there's a tomb chest, again coeval with the building. The heraldry features three pickaxes, and over the tomb there are some fragments of stained glass with the same device. 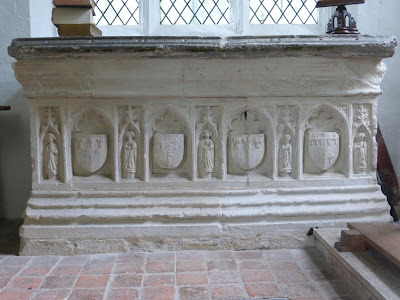 These are the arms of Sir John Prysot, who died c.1450; the prominent position of the tomb probably means that he paid for the building of the church. 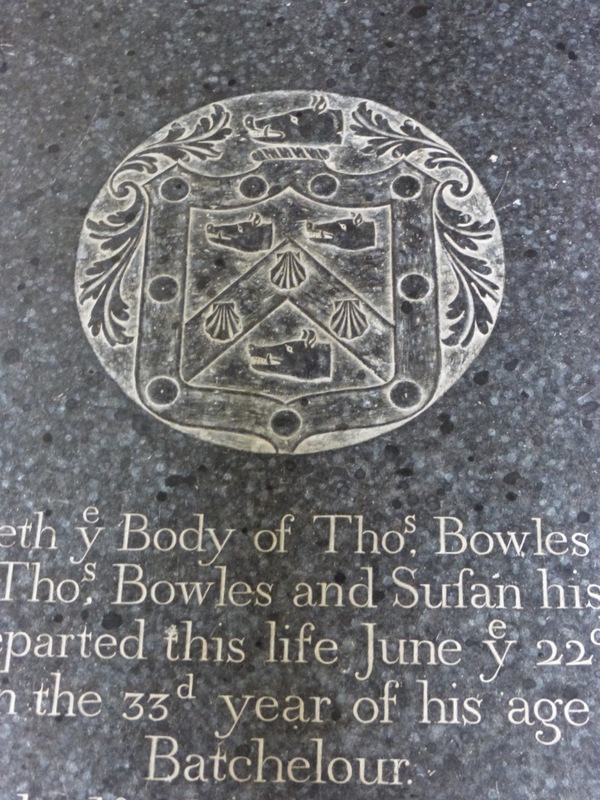 There are some attractive ledgerstones on the floor; this one features four boars' heads and three scallop shells. 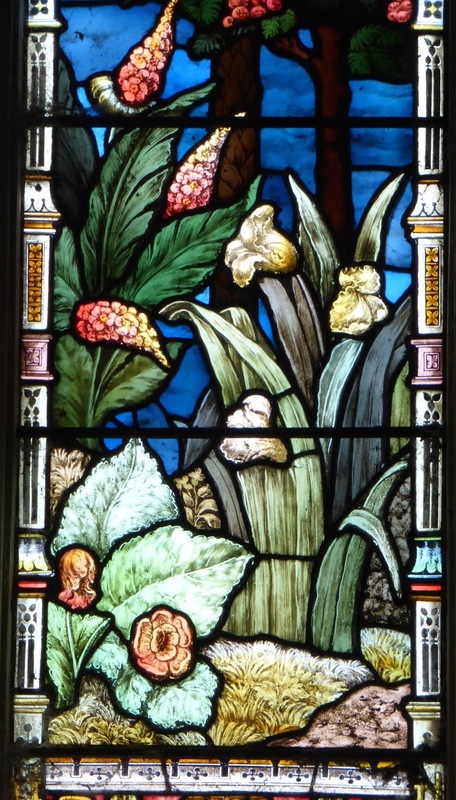 The Victorian chancel has an exceedingly nasty spotty grey marble floor (a great contrast to the plain tiles of most of the church), but the east window of 1867, (its maker unrecorded), although not a completely successful design, has some exotic flora in the outer lights. Both are impossible to date (except of course they can't be older than the church itself), but the supposition is that they illustrate a mummers' play. This is as good a guess as any. Returning to the outside of the church, looking at the tower makes me reflect that towers badly need battlements, or pinnacles, or a Hertfordshire spike, to top them off and prevent their meeting with the sky being too abrupt*. The completely flat top is very unbecoming. The stonework of the upper storey windows on the east and north sides has recently been renewed, and the label stops carved as curious heads, in the best traditions of Gothic masons. 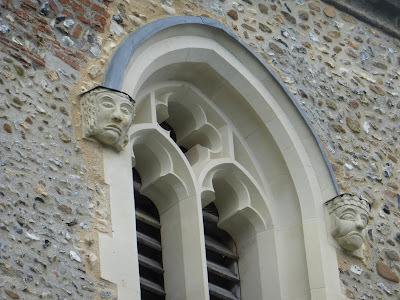 As far as I know, there's no information in the church or its guidebook about the heads or their inspiration, which is a shame; I like them very much. 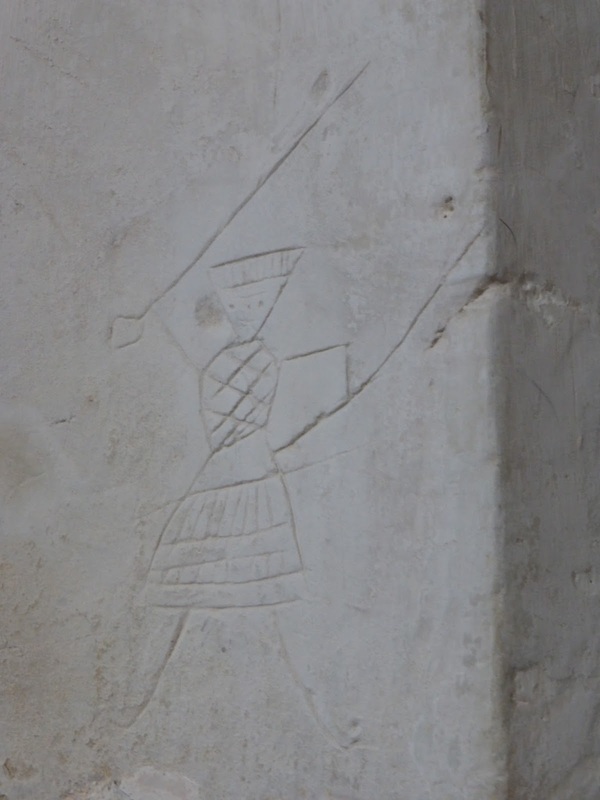 The one on the right in the top picture seems to be wearing a crown. 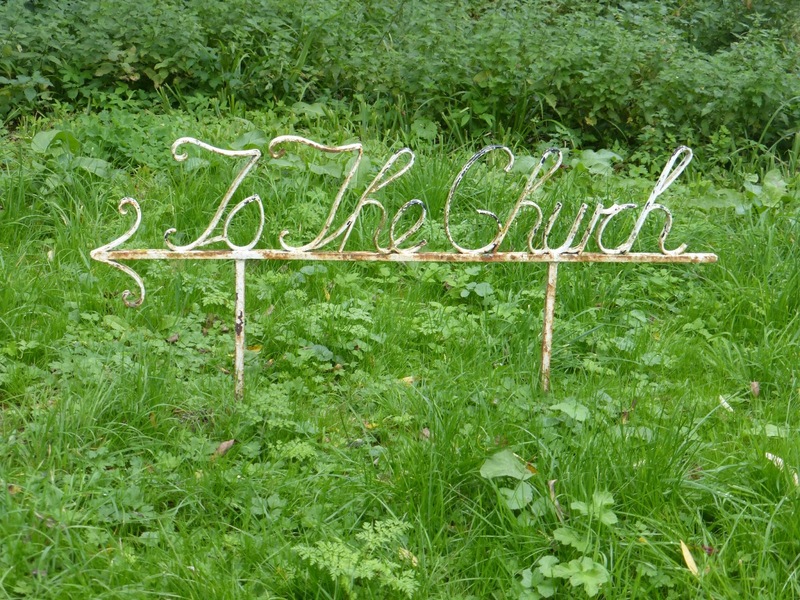 The church has always been open whenever I've visited, and I get the impression that it's much-loved and that its custodians take pride and pleasure in presenting it. 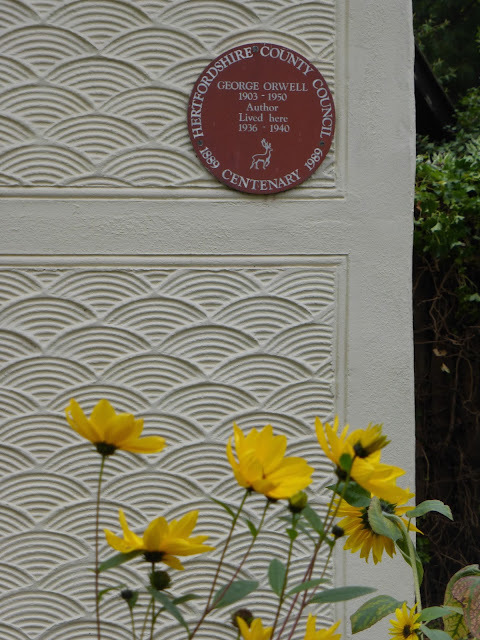 There's currently a small exhibition at the west end of the aisle about the church's history, and in particular its connection with George Orwell. Orwell (real name - though I've never been sure why a name given to us by our parents is any more real than one we choose ourselves - Eric Blair) first moved to Wallington in 1936. The house he lived in looks very attractive now, but then it had a corrugated iron roof, an outside toilet and flooded when it rained, (but the rent was only 7/6 a week). He was married in the church in June 36; photocopies of his marriage certificate are sold there. 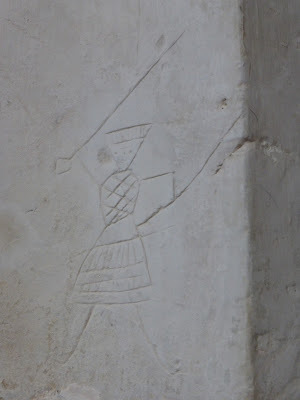 He wrote a letter to an old schoolfriend on the morning of his wedding saying that he was 'writing this with one eye on the clock & the other on the Prayer Book, which I have been studying for some days past in the hopes of steeling myself against the obscenities of the wedding service.' 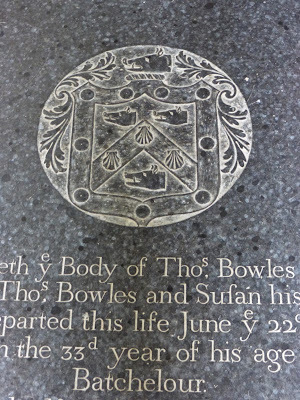 I think the chancel floor on which he stood as he said his vows is far more obscene. It must have been in Wallington that he witnessed a large cart horse being shooed along a lane by a small boy, and saw a parallel between this and the working classes being controlled by their bosses. 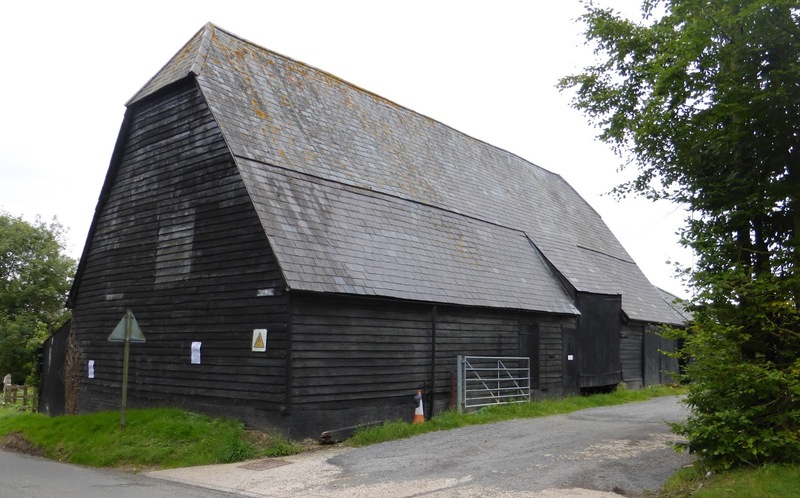 When he later came to write Animal Farm he used Wallington (changing the name slightly to Willingdon) as the setting, and in particular the barn in which Old Major addresses the animals at the beginning of the book. 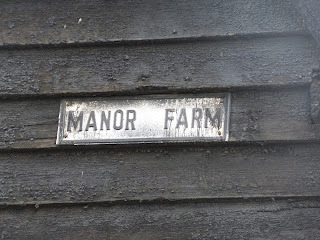 If the farm to which the barn belongs had been called anything other than Manor Farm then it's likely that he would have called it Manor Farm in the book anyway, as this name perfectly suits the feudal atmosphere before the rebellion. 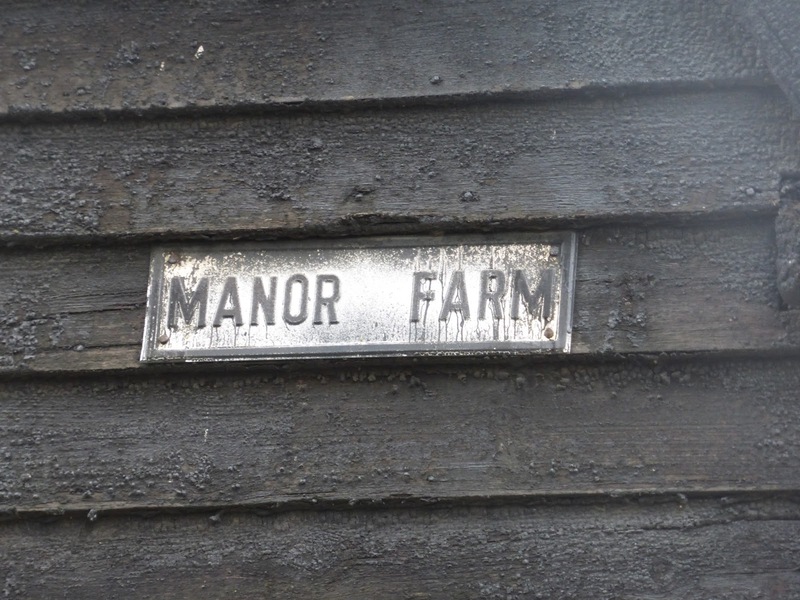 But the farm really was and is called Manor Farm. Orwell wrote much his best pre-war novel, Coming up for Air, in 1938-9 when he was in Morocco for his health. 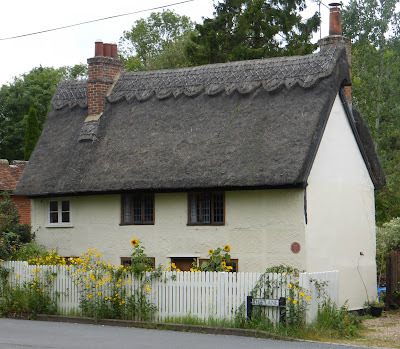 It's often said that in this novel he draws on his childhood memories of the countryside around Henley-on-Thames, but I've never heard anyone mention the possibility that the countryside around Wallington, much fresher in his mind, must also have had an influence. 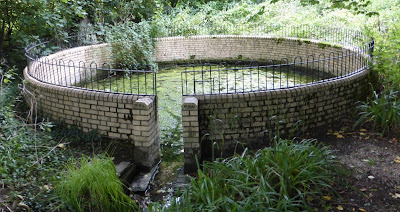 A late Victorian well built around a spring, now rather neglected. * Apparently there was once a stair turret, which must have helped a little.